garagebandmusic has no other items for sale. Product is as advertised, Good Price, Arrived On Time Great Ebayer! Hohner harmonicas are among the best made. Even though most of us can make do with the less expensive ones, Hohner does make high end models when you are ready to move up. This model, Bluesband, is one of their oldest creations and is excellent for beginners. It is easy to play and proxuces a very good sound. It is well worth the money. 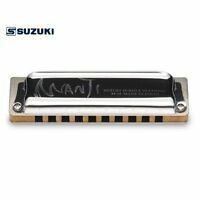 I'm a rank beginner, and this is the first time I can recall picking up a harmonica. I can make beautiful, rich sounds come out of it. I'm looking forward to actually learning to play. It's a pleasure just holding this thing and dreaming of the music I'll one day make. Perfect instruments for children, Our Grandsons love playing the Harmonicas. these are perfect. Nice sound! really smooth and soft. The international - a really nice Harmonica.